Bird themed save the date card with a calendar style design. A Bird themed save the date card to send to guests to let them know a date has been set for your wedding. 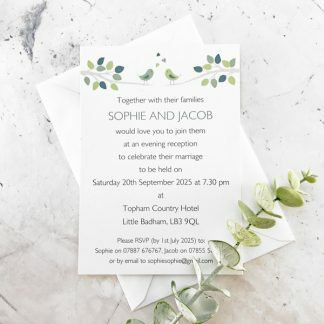 This means wedding invitations can be sent much closer to the wedding date, secure in the knowledge that your guests will keep the date free. The design features a calendar showing the month of the wedding, with the wedding date highlighted by two little hearts. At the top of the cards are two love birds sitting on branches with hearts above their heads. The text can be customised but usually includes the names, date of wedding and the location if this is known at the time of ordering. Each of these bird themed save the date cards measures 10.5 x 14.8 cm. The design is printed using durable pigment ink on high quality white or ivory 300 gsm card, with a smooth or textured finish. 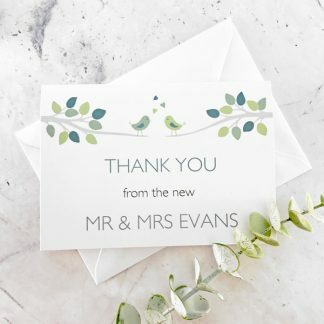 The design has a colour scheme of your choice, based on any two colours, which can be chosen from the wedding stationery colours page. 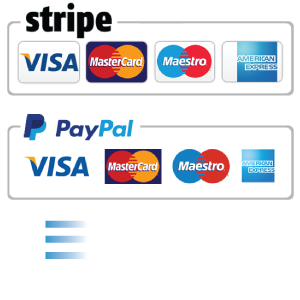 Each card is supplied with a matching white or ivory envelope. 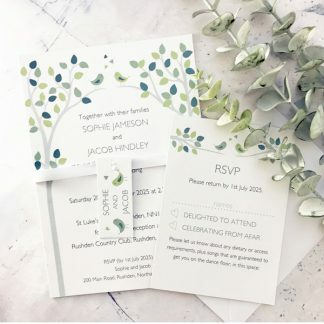 The design co-ordinates with the Bird wedding stationery range, which includes day wedding invitations, evening wedding invitations and matching stationery and accessories to use on the wedding day.